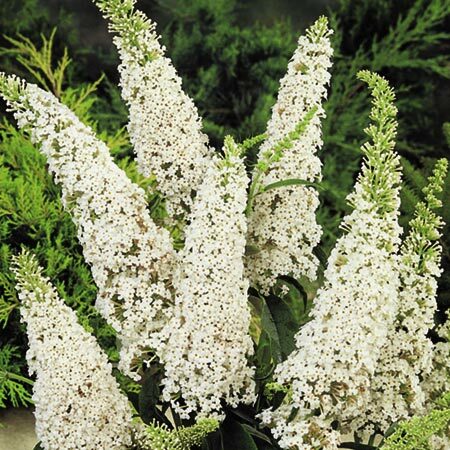 A lovely variety of large, pure white strongly fragrant flowers that have a tiny central golden eye. Elegant arching branches. The honey fragrance attracts a mass of butterflies and bees into the garden helping to confirm its common name 'Butterfly Bush'. Great in white and green gardens, wildlife gardens and ideal in mixed border plantings. Will create structure and colour in your garden in the years ahead and great for wildlife lovers. Flowers July-early September. Height 150-200cm; spread 100-150cm. Supplied in a 3 litre pot. Ideal for beds and borders. Scented. Attractive to butterflies, bees and birds. Grows well in sun or shade.